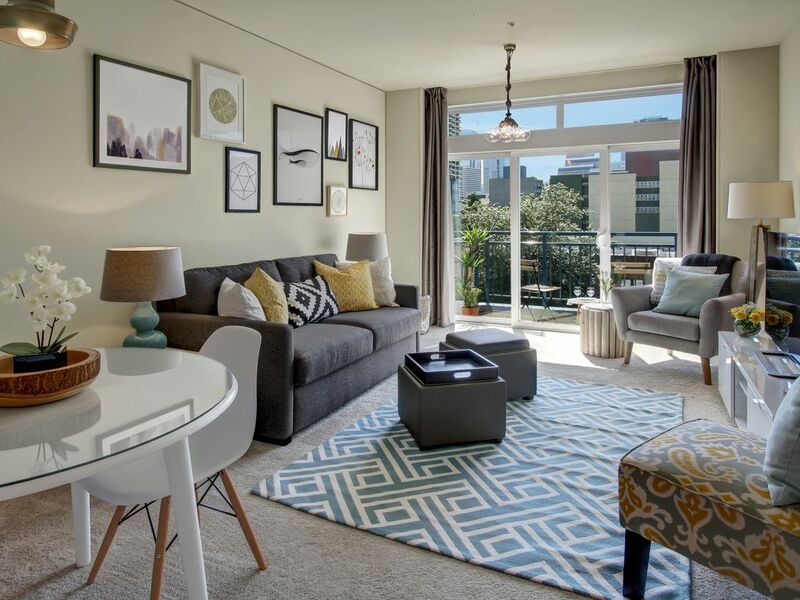 Seattle Oasis Vacations is pleased to provide a comfortable and inspiring one bedroom vacation rental condominium in Seattle's exciting Belltown neighborhood. This property is easy walking distance to some of Seattle's best restaurants and the Pike Place Market. It's convenient to all of Downtown Seattle and the Convention Center as well as the many sites for which Seattle is famous, and just blocks from the water front. It's bright and open floor plan with cheerful splashes of yellow make a stylish home away from home. This lovely vacation home sleeps up to 4 guests and includes a fully equipped kitchen and peek a boo view of Elliot Bay from the living room balcony. With hotel mattresses and luxurious 800 thread-count sheets, we guarantee you'll be as comfortable as in any of the best hotels in town. 2 High Definition Flat-Screen TVs, and Wireless internet throughout make this condo the perfect place for a long weekend or a week's stay in the West Coast's most dynamic location. An on-site swimming pool & hot tub, plus a full fitness center and sauna can make your stay long on luxury and very convenient to all of Seattle. Private secure parking is also available on site. This Belltown Condominium is within easy reach of nearly all of the downtown attractions, including the museums, sporting arenas and more. To be clear, A/C is provided via a window unit during summer months (almost NO buildings-less than 5%- in Seattle have central air conditioning). Also, be aware that this is a urban environment. In any urban core, you can expect to hear street noise, often late into the evening. If a silent outdoor environment is important to you, downtown Seattle (or any big city for that matter) may not be the best place for you to stay. That being said, this unit in the heart of Seattle--walkable to all the best Seattle has to offer-- and has high quality, noise muffling windows and heavy duty construction. Any questions about this, ask! We want our guests to be happy. My wife, Sally and I are excited for you to stay with us! We originally purchased a condo in Belltown to use as a second home in the winter of 2007. Because of our knack at hosting, great marketing and amazing design, what was just an investment has become a full time business. We currently have 30 properties in the heart of Downtown Seattle that we either own or manage on the behalf of others. Sally is an interior designer by trade, and I'm sure you'll be able to tell when it comes to the quality items to help you feel comfortable while you are staying with us. We take our position as hosts very seriously. Our condos are cleaned immaculately and have the best staff in the business. We are both foodies, and welcome the ability to share with you the best places in the city! Thanks, and we look forward to hosting you! This building is centrally located; close to the Pike Place Market, flagship Nordstrom, Space Needle and Seattle Center, and Seattle waterfront. We are surrounded by an eclectic urban neighborhood, full of shops, restaurants, and nightlife. You will love our property! You can pack light. We provide everything you will need to make you comfortable during your stay. Besides towels and linens, we provide shampoo, conditioner, body wash, a starter supply of toilet paper and paper towels. A high chair and pack n play are available for a flat rental. High end towels and shampoo, conditioner and body wash are included. We are located in the heart of downtown Seattle. Park you car in the building and leave it there, walk everywhere so you won't miss a single thing. The ambiance of this building is wonderful! You are close to all the Seattle sights, such as the Market, the Space Needle, waterfront, and more. In the building itself (ground floor) is a pizza place, cajun eatery, two Italian restaurants, a Subway, a Korean take out place, and the best classic sushi on the west coast, as well as a small grocer. The Belltown neighborhood is eclectic, with 100s of restaurants, plus night life and shops within walking distance.The ambiance of this building is wonderful! You are close to all the Seattle sights, such as the Market, the Space Needle, waterfront, and more. In the building itself (ground floor) is a pizza place, cajun eatery, two Italian restaurants, a Subway, a Korean take out place, and the best classic sushi on the west coast, as well as a small grocer. The Belltown neighborhood is eclectic, with 100s of restaurants, plus night life and shops within walking distance. Great welcome from the staff. Everything that you need in the property. Comfortable bed, cooking facilities and utensils. The place is cosy and right in the heart of downtown Seattle. Thank you, Melanie! Hosting you was a pleasure as well. Looking forward to welcome you back anytime soon! Thanks for staying! Nice and clean blankets could of been a little fresher to my liking but still ok. Love the little extra that was provided in the kitchen spices, olive oil it helps when your away and want to cook some fresh fish, shrimp and vegetables from the Pike market. Very easy. I would use Oasis on my next trip. The apartment is in a great location and walking distance to many attractions. The space was clean and spacious. We really enjoyed our stay and would recommend it to others. Great unit, very clean, the carpet issue that I have seen mentioned in other reviews seemed completely minor and a non issue to us. The welcome basket of waters/coffee was a nice touch. Many local attractions are within 1 or 2 miles of this unit. We walked just about everywhere from Pikes Market, Columbia Center, The MoPOP, even Safeco Field - Bring good shoes! The area is very laid back and lots of great restaurants & bars all around. There is a bit of noise at night coming from the street & lounges on the ground level, but nothing that isn't to be expected of a lively urban environment. If your luggage is relatively light, take the light rail to and from the airport and save yourself a lot of $$. The reasons I can't give this property five stars are the fact that the pool was closed the entire time we were there (a bummer for my teenage daughters) and the fact that the carpets were really, REALLY stained. The apartment looked a little worse for the wear in general, like scuffs and scrapes on the walls/trim, but the furniture was clean and there was no smell so we didn't feel like it was dirty. But the carpet badly needs to be replaced or deeply, DEEPLY cleaned. If the carpet situation was improved, I would highly recommend this as a great place to stay in Seattle. Our beautiful property is centrally located in downtown Seattle. From it, you are an easy walk from the waterfront, Pike Place Market, flagship Nordstrom and the retail core, and Seattle Center. 100's of restaurants are in this neighborhood, along with unique shops and nightlife.